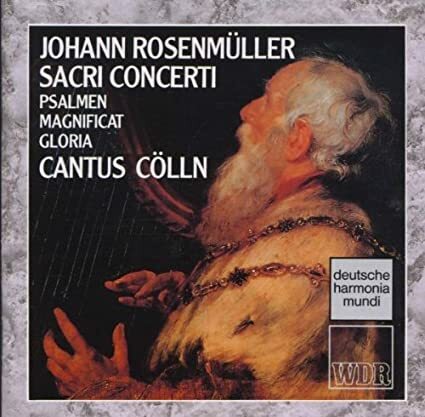 From the DHM long box, my first exposure to the music of Johann Rosenmüller, a German composer who was forced to spend decades in Italy due to some indiscretions. 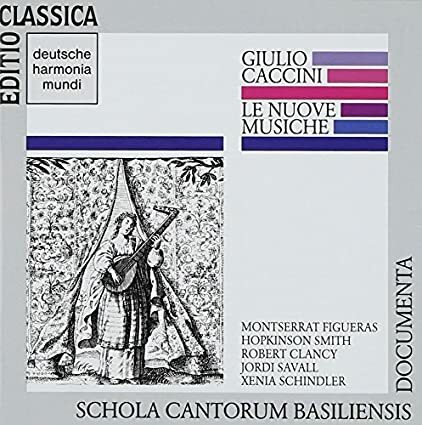 Generally, the music has more of the rhythmic vitality one might expect from Italian or Mediterranean baroque composers than the more serious, meticulous style of Germans of the era, but it does seem like something of a hybrid. It's spontaneous, but within bounds. No extroverted excess like with Torres, for instance. It's enjoyable, but not as enjoyable, for me, as the Torres or Schütz discs heard earlier. The small ensemble plays with admirable precision and transparency. The only complaint I have is the use of a countertenor. I would have preferred a woman sing the part, and though sometimes countertenors blend very well, here, sometimes the voice stands out more than I prefer. Countertenor fans would likely have no beefs in that regard. Superb sound. From the Jacques Mercier box. 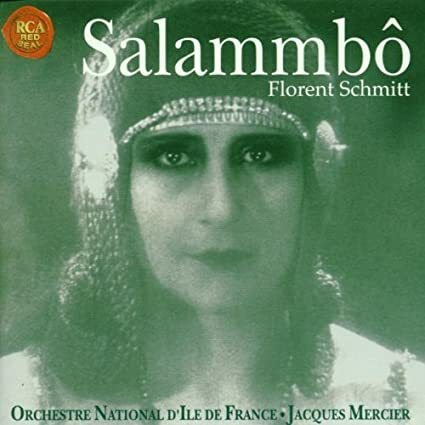 This recording of Salammbô is the first thing I've heard from composer Florent Schmitt. It's a score for Pierre Marodon's 1925 film adaptation of Gustave Flaubert's novel of ancient Carthaginian goings-on. If I hadn't read that tidbit, I would have thought this lengthy suite was taken from a stage work of some sort, either an unpopular opera or more likely a lengthy ballet. The music is obviously set in scenes, meant to evoke or augment imagery of some entertainment for a viewer. There are vibrant, propulsive sections; more ruminative sections; more eerie sections; and the like. The music is often sumptuous and even voluptuous, generating a gorgeous and vaguely but safely exotic fin de siècle sound world. Schmitt had no little expertise in orchestration and the suite is entertaining as all get out, with perhaps one or two spots that might fail to elicit maximum engagement from the listener. Sound is generally very good, though in tuttis and with the chorus singing at full tilt in the third suite, sound becomes a bit hard and glassy. 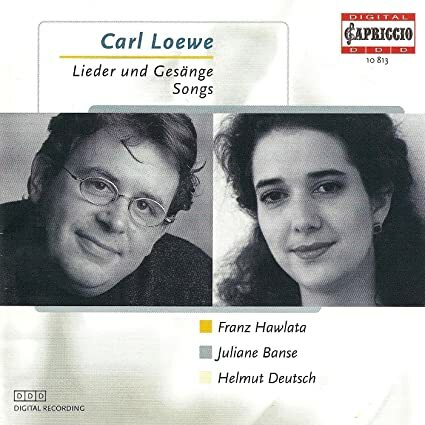 I'm pretty sure I'd never heard a note of Carl Loewe's music before I listened to this disc. I was originally going to write something detailed, but as I listened, all of the works sort of blended together and emerged as a collection of perfectly nice lieder that sound like either discarded Schubert sketches or Schubert knock-offs. The songs certainly sound nice and never sound less than ably crafted, but they don't excite or enthrall. Of course, the reason the bought this clearance disc was to hear how the young Juliane Banse sounds. I was unsurprised to learn that she sounds splendid, with all the control and beauty I've heard in every recording I've heard from her. Thanks to Ms Banse, I can still rate the disc a success. Noted. Loewe may be - is - worth another shot. Thanks. Better still, get this 21-CD series. I donned my Helmut of Prognostication®, and this set will not be finding its way into my collection. I donned my Helmut of Prognostication®, and this set will not be finding it's way into my collection. I suspected that much. Worth getting, though, if only for the cover art of the individual discs. Some very fine music as a bonus. Maybe this one will be more appealing? Of course he's not. The disc is nice, though. Yet another gem from the DHM box. Now, this disc was more or less guaranteed to be at least good given the involvement of Jordi Savall and Montserrat Figueras. The disc contains fifteen short songs from both the 1601 Le nuove musiche and the 1614 Nuova Maniera di Scriverle. The lightly scored songs, laden with lotsa baroque guitar and lute and viola da Gamba, with some harp, all unfold in a completely comfortable way, often sounding predictable, even as they were brand new to these ears. These are ancient, late Renaissance songs, but they still seem somehow contemporary, or at least like something folk singers might conjure up under the right circumstances. Figueras sings beautifully, and distinctively, and sound is strikingly good for a recording from the early 80s. Delightful. With the Mercier box, I quasi-unintentionally bought more recordings of a composer I do not hold in high regard. I'm not a fan of Saint-Saëns' symphonies, his violin concertos, his piano concertos, or the solo piano works I've heard, unless Bertrand Chamayou happens to be the pianist. The composer's opera Samson et Dalila has its moments, but not enough for me to have listened to it in the decade or so. Now I got to hear this non-believer's take on church music, starting with the Requiem he penned in a week. It's more in line with his opera than his other works. 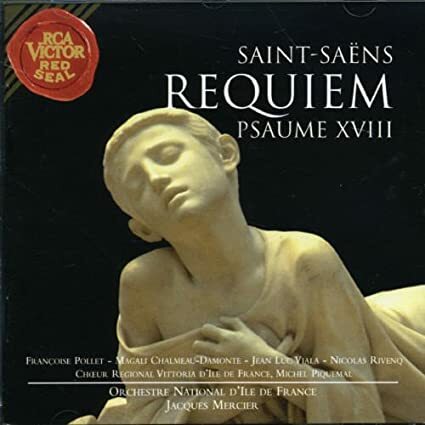 The Requiem is dramatic, almost operatic at times, which is fine. 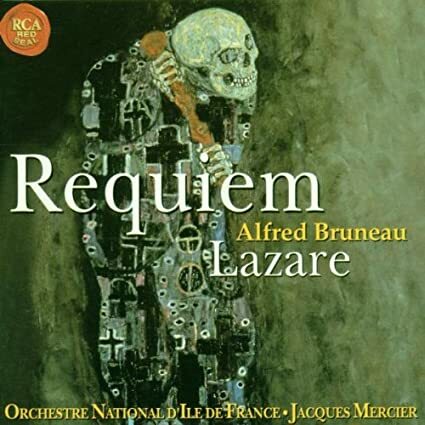 The Dies Irae benefits from quasi-Brucknerian brass playing and a bit less from hefty organ blasts, and Oro supplex is lovely and somber without overdoing anything. The Sanctus, on the other hand, is exultant, maybe too much, though its brevity and its Wagnerian violin writing is certainly not unattractive. The Agnus Dei falls just shy of packing an emotional wallop; it never really delves deep, which is true of Saint-Saëns' music in general. Psaume VXIII is about the same length, but in addition to sounding superficially lovely, it feels swifter and crisper. There seem to be hints of Mendelssohn, and various other sources of inspiration. Overall, it works a bit better, or rather, is more to my taste. The singing, playing, and recording are all sufficient to allow for ample enjoyment. I'm certain one copy of both works will suffice for the rest of my life. Some liturgical works by Jan Václav and Václav Jan. For a few measly bucks, I picked up this disc of the complete liturgical works by Jan Václav Voříšek - two whole works - and the Messa con Graduale et Offertorio by Václav Jan Křtitel Tomášek. Two of the three recordings are world premieres. The Voříšek works start things off, first the half-hour-ish Missa Solemnis, then the four minute and change Offertorium Quoniam iniquitatem. Both works have something in common: a very Classical sound, blending the soundworld of Haydn and Beethoven, with an emphasis on the former. The longer work is the stylistically lighter of the two, but it is suitably scaled and very much meant for public consumption in a proper setting. The smaller work packs more of a dramatic punch, and is more to my liking, though both are good and earn well deserved applause from the audience. The Tomášek, though, is something meatier. Very Haydnesque, there's a grandeur and weight and drama that makes the work more satisfying. It has an almost perpetuum mobile feel to it, moving forward inexorably and at times almost triumphantly. (Not LvB-style triumphantly, though.) At times, there is mucho musical beauty, too, as in the at times touchingly lovely Sanctus. There's no time for dourness or excess weight or bloat here, no sir. The work is an unexpected treat, and it alone would justify full price. Singing and playing is good enough so that any shortcomings are easily ignored. The live sound is pretty good, if characterized by a bit of glare here and there. From the Mercier box. Here's a Grand Opera Requiem. Bruneau goes further than Berlioz in grandeur and romantic excess. As I've seen mentioned before, this is the polar opposite of Faure's Requiem. This fact is literally blasted at the listener in one of the most intense and violent takes on the Dies Irae I've heard. Berlioz and Wagner merge into a (faux) frightful wall of music. The inclusion of the Gregorian plainchant Dies Irae adds to the allure. The rest of the work cannot possibly live up to the intense theatricality of this movement, the opening to Et lux perpetua aside, but it more or less remains more theatrical than liturgical in approach throughout. That's not a knock. Indeed, the work is quite excellent. It's a less somber Requiem. The roughly as long lyric drama Lazare discmate is likewise theatrical and often very lovely. Against expectation, the male soloists are more to my liking than the female soloists here. Overall, this is a superb disc with a corker of a Requiem. Now, that's based on early impressions. I don't know if it will wear as well as other requiems. Singing and playing is up to the challenge. This Mercier box is quite the find, unearthing obscure works - warts and all. Like opening the proverbial shoebox full of old photos. Well, hot dog! Here's an unexpected delight. 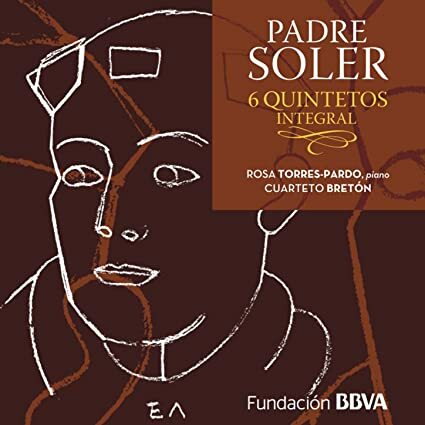 Soler wrote a half dozen quintets for keyboard and string quartet, and here an all-Spanish group of musicians deliver the goods. Rosa Torres-Pardo, whom I've heard in Albeniz and Balada, and the Cuarteto Breton, whom I've heard in Guridi, play all six works on both discs with an irresistible sense of fun and energy and a generally very sunny disposition. To be sure, this is as non-HIP as a recording can get, but so what? For probably the first time in my listening experience, I thought to myself "Hey, that sounds a lot like Boccherini", and meant it in a purely positive way. The buoyancy, gentle rhythmic swagger, and light but not slight music just grooves. Ms Torres-Pardo plays her part in a very Soler-Scarlatti type of way, really delivering - to the point where I would very much like to hear what she can do solo in Soler - but really, it's the Breton who make the disc work. Being familiar with Soler's keyboard writing, I was pleasantly surprised to hear how well he writes for strings. To be sure, the string writing does sound rather influenced by music of the time (ca 1770s), but then so does most of the music of time, or at least the music I've heard from the time. These works are also available in harpsichord and strings and organ and strings (!) alternatives, and perhaps one day I try one of those, but this twofer caught me off guard, in a most pleasant way. This is why it's always good to try new things. 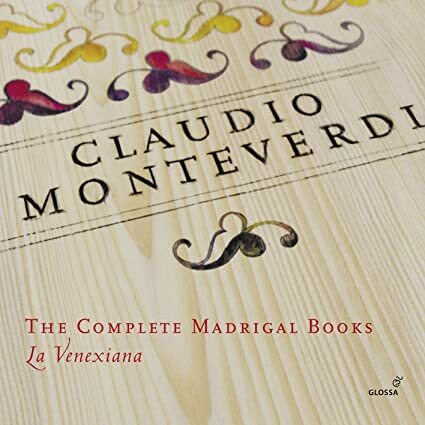 For years, the only Monterverdi I knew was the Vespro della Beata Vergine from 1610. If a composer is gonna be a one hit wonder in a library or collection, this is a Sir Mix-A-Lot level of success. Finally, last year, I did pick up E il Suo Tempo as part of the DHM long box, along with a third version of the Vespers. Of course, I knew about Monteverdi's opera, but opera for me is mostly a Mozart and forward type thing. I was also aware of his Madrigals, but I dilly-dallied. Then, for no particular reason, I figured I might as well give them a shot. Rather then mixing and matching, and against my better judgment, I went the easy route and picked up La Venexiana's traversal of the complete set on the evil record label Glossa. Both ensemble and label deliver routinely superior results, with recordings so good that one soon thinks of buying even more titles from said artists and label. In this way, the parties involved are nearly as wicked as Jordi Savall and his cohorts. As I listened to the first disc, with the first book of Madrigals, I thought "A-ha! The spell is broken!" It's not that the music or performances are bad - far from it - it's more that the music and performances are run of the mill in a high end sort of way. The music sounds lovely, if simple. It lacks the spark of the Vespers. It's like less sophisticated Spanish Golden Age music stripped of devotion and complexity. It sounds comfortable and easy to listen to. The Ninth book offers more, with instrumental accompaniment to go with the lovely vocal parts, as well as some theatricality. It's closer to the Monteverdi I had become accustomed to, but it's brief and fragmentary. As I listened to the Second and Third books, I had much the same reaction as to the First book. So far, so good, but nothing binge-purchase inducing. Whew. The Fourth book shows slightly more troubling signs, with more sophisticated vocal parts. The Fifth and Sixth book demonstrate even more sophisticated writing, with vocal harmonies approaching nearly hypnotic levels of quality at times. Accompaniment becomes more pronounced and sophisticated. And then whammo! !, the Seventh book arrives. Truth to tell, I started getting quite worried in parts of the Sixth book, but in the Seventh, that spark of the Vespers returns. Not only is there sophisticated vocal writing and sophisticated, if comparatively limited, accompaniment, there's snap, crackle, and pop to the music. It's alive, vital, and theatrical. It's eminently and completely entertaining. Crap. Then there's the apotheosis of the Madrigals, the three-disc Eighth book, the Madrigals of War and Love. Everything that I enjoy about the Vespers is more or less there, spanning hours, inviting me to drop everything else and just wallow in the musical and sonic goodness. Want to have an hour melt away without noticing? Spin one of these discs. It's difficult to adequately convey the time-killing efficiency of these recordings. To be sure, they don't assume the transportive, transcendent, all-consuming power of the music of Cristóbal de Morales, but they come closer than they have any right to. Then there's the last disc, a grab bag of individual selections of the Madrigals from real, live concerts. Of course the ensemble does good things; they advertise their quality, teasing the listener, almost daring the vulnerable sap to not attend a concert if the ensemble shows up in whatever town or hamlet the helpless and hapless music fan lives in. And wouldn't you know it, especially after hearing the Eighth book, I started perusing Amazon for more recordings of the works, by the ensemble, and on the evil label Glossa. Dammit. Superb sound, singing, and instrumental playing throughout. Of course. That's how they get you. Much as I enjoy reading your reviews, Todd --- and they are among the most enjoyable things on this board ---, in the end I am invariably reminded of Hermann Scherchen's dictum: Music must not be understood, it must be listened to.. And of the Romanian proverb One can't see the forest because of the trees. But by Jove and by all means, keep them coming. From the Mercier box, a twofer of Saint-Saëns. Never let it be said that my general antipathy for the composer prevents me from trying again. And again. This twofer contains two big works and six smaller ones, with Victor Hugo responsible for writing the lyrics for most of the pieces. A variety of singers of repute are involved, including Natalie Dessay. The first disc opens with La Lyre et la Harpe. The opening Prelude alternates between organ music and Gallicized, Mendelssohn sounding orchestral music before transitioning to some lovely choral music. As the piece moves along, soloists sing with an organ accompaniment and the chorus sing wonderfully en masse, with the mood sometimes darker and more dramatic, and sometimes lighter and dramatic. The music is undeniably attractive on the surface, but it doesn't seem to have much depth, a common trait for Saint-Saëns. When I hunted down the translated Hugo text, it turned out that the composer did not have the greatest poem I've read to set to music. Ultimately, the superficiality doesn't matter; were the music too profound, the piece wouldn't be as balanced. This is an excellent piece. The other four works - L'art d'etre grand-père, Rêverie, Le Pas d'Armes du Roi Jean, La Cloche - are brief and lighter and all quite attractive. 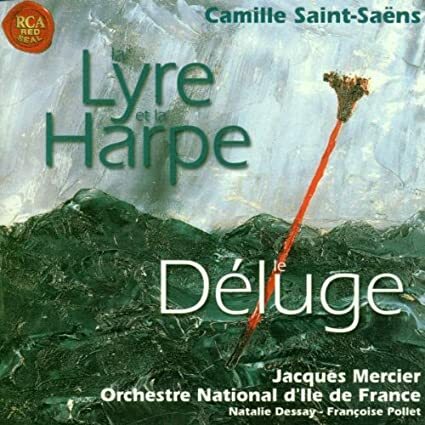 The second disc contains the oratorio Le Déluge, which covers the biblical flood, as well as La fiancée du timbalier and La Nuit. The main work starts with a pretty as all get out Prelude before moving to the more dramatic, and perhaps melodramatic, three parts with soloists and chorus. Camille does something unexpected here: he makes it work. While by no means a work I will spin regularly, the expert vocal writing, delivered superbly, melds in with the sometimes too saccharine, sometimes faux-dramatic, but always lovely music. Sometimes one can detect big whiffs of Gallicized Wagner, and also some proper French influences (a lither Berlioz, say), all meticulously crafted, but to more musically satisfying ends. La Nuit is quite light and appealing, if slighter, and La fiancée du timbalier is a bit garish in places for me. So, as far as Saint-Saëns recordings go, this is a home run for me. The two big works both work better than expected, and the smaller works vary in quality but never sound terrible, so I will be able to listen again in future years without fear of excess cringing. A few years back, I started listening to Spanish Golden Age composers. Cristóbal de Morales stood out and stands out as the rock star not just of that era and group, but of all polyphonic composers. To be sure, other great composers penned mighty fine music, but there's just something about Morales. Last year, I discovered Cipriano de Rore while working my way through the DHM hundred disc long box. His St John Passion is austere in the extreme, but his music has that same something-something that Morales' has. I decided to try another disc, and settled on the brand-spanking new disc from La Compagnia Del Madrigale on the wicked Glossa label. I was even coerced into paying full price for the disc. Sure enough, this disc of various and sundry madrigals displays the same musical magic as the Passion. The music sounds even more immediately appealing. The writing sounds less austere, more fluid, more consciously beautiful. The various melodic strands exhibit the same absolutely attention grabbing goodness of Morales. The sparse accompaniment, when it pops up, sounds as good. The madrigals themselves, occasionally about something vaguely political or praising this or that personage or river or whatnot, mostly rely on that millennia old fallback of some horny dudes scribbling for nooky. And why the hell not? Men have penned many excellent works in the hunt for lovin'. Some of the texts are actually quite good, but really, it's the musical treatment that matters, and that is out of this world. I ended up with a good sized chunk of the Morales discography, and now it seems I can collect Rore discs and experience the same level of musical happiness and exploratory joy again. Outstanding! 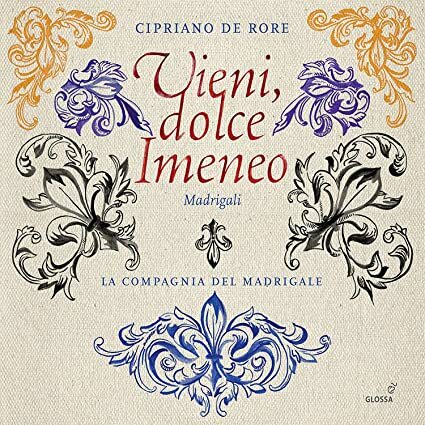 Based on their superb recordings of Gesualdo and Marenzio, I expected La Compagnia Del Madrigale to deliver ace work, and they do. Glossa delivers world class production values in its remorseless assault on my wallet.